On Friday, things didn’t quite go veteran driver Ken McFarland’s way. 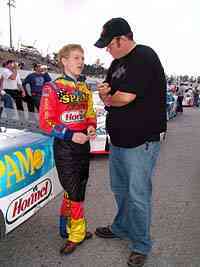 He qualified 31st for the Snowball Derby, missing the transfer spot by just one qualifying spot. Therefore, he had to run the last chance race on Saturday night trying to transfer into the main event. “He was DQ’ed for soaked tires,” said Brooks. “That is a big no-no. My sniffer went off on them. They checked out a lot softer than any other tires that I’ve checked all year. I also smelt it. “I didn’t show him the durometer readings. I had already had the tires broke down at that point. I couldn’t show him the readings. But he knew they were soaked. 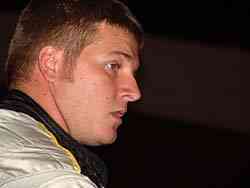 The DQ moved Boris Jurkovic back into the Snowball Derby after he failed to make the show through the last chance event. McFarland did just that, leading all 25 laps of the last chance race. However, when McFarland went through post-race tech, he was disqualified for using soaked tires. “I don’t know. I just don’t know. We can try to have Fritz (Augustine, fellow Five Flags Speedway official) talk to him, but I don’t think it is going to get anywhere. McFarland was visibly upset. Tech Director Ricky Brooks commented on the situation. Every year, there are always a few noteable names that miss the Snowball Derby for various reasons. 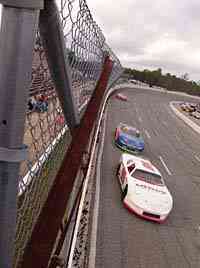 This year’s Snowball Derby DNQ list could have qualified as a top-notch feature at any track across the nation. Bradley Riethmeyer, Dwayne Buggay and Danny Bagwell. 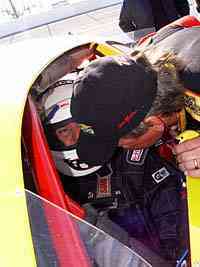 The biggest name was that of JR Norris, who was driving the #5 car for Richie Wauters. “It's been a tough day, tough week and tough year,” said Norris. “It just hasn't been my year. I thought it was going to end up being a good year and I ended up winning four or five races total. Just when everything seemed it was going to get going good it got worse. JR Norris was one of the biggest names to load up. On the opposite end of the spectrum was Landon Cassill. Cassill finished fifth, the final car to transfer. 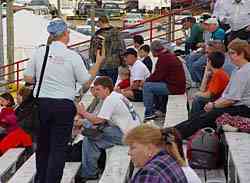 There are always plenty of big names at the Snowball Derby. But every year, there are also a few that are missing as well. This year, one of the biggest names missing from the Super Late Model world was last year’s Snowball Derby pole sitter, Gary Helton. Ryan Mathews might have traveled the farthest to miss the event, coming from Wisconsin. “I’m disappointed we couldn’t be competitive here,” said Mathews. “We’ve never raced here before, but we talked to everyone we could, but just jumping in and trying to guess how to qualify, we ended up just a little free in qualifying. I’ll probably come with a different package next year. Davidson was involved in an early accident, which put him behind. 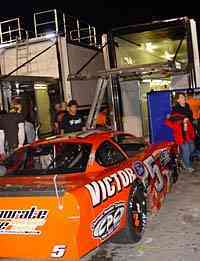 Senter, running in just his fourth Super Late Model series race of 2005, qualified an impressive 15th for Sunday’s Snowball Derby. The GAS Series is a Pro Late Model (two-barrel carb) series. Helton has been roaming the pits though, working with some of the teams who run his company’s Volunteer Race Engines. “It is tough,” said Helton. “We have always been here every year for quite some time now. It is hard to miss this race. I guess we are saving money, but it is still pretty tough to be here and not be racing. It hurts to not be out there running. For the second year in a row, the Georgia Asphalt Series champion has turned in an impressive effort during the Snowball Derby weekend. This year, Joey Senter is leading the GAS charge. Gary Helton is at the Derby, but is not driving. During Saturday morning’s driver’s meeting, CRA Super Series founder RJ Scott made an big announcement for the Super Late Model world. CRA officials, along with several other sanctioning bodies, are working to form a four- or five-race series that that will help push Super Late Model racing into the forefront. “It will include Nashville’s All American 400, the Snowball Derby, SpeedFest and the return of the Winchester 400,” said Scott. “All that stuff is hoping to have a big ‘Four Crown’ type of deal. 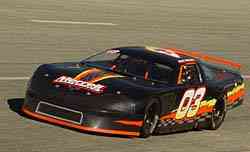 We are trying to bring back some of the great Super Late Model races. There has been a little bit of a learning curve from the Pro Late Models to the Super Late Models. More details will be finalized soon. Growing up in the the Mobile, Alabama suburb of Irvington, Cale Gale knows about the history of the nearby Five Flags Speedway in Pensacola, Florida. 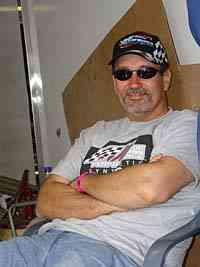 Gale has his eyes set on making the short trip home with a Snowball Derby trophy by race’s end on Sunday night. Judging by his 13th place qualifying run on Friday, Gale has a great opportunity to win the biggest race of his career in his first Derby start. 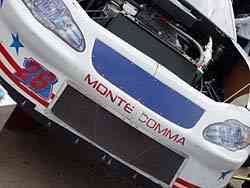 CRA officials have been working to bring prominence back to Super Late Model racing for some time. “We are wanting to bring more uniformity to what we are doing and help develop popularity in more areas. We want to bring Super Late Model racing to what it used to be, when you had a racecar that you could go run with at different places around the country. For a number of years recently, that wasn’t the case. But now, we are getting back to that. “With the promoters getting together to do things like this, it is really exciting for the racers, the teams and the fans. Things are still being finalized, but all of the parties have agreed to pursue it. This will hopefully start with the return of the Winchester 400 in 2006. There is some big news coming for Super Late Models. Matt Merrell was perhaps the most excited Snowball Derby driver to not make the starting field through time after qualifying on Friday. Merrell struggled throughout Friday’s practice sessions and even slapped the wall with the driver’s side of his car halfway through. After some hard work by the crew, Merrell got back on the track late in practice and was even able to get even more speed out of his car in qualifying giving him hope for Saturday’s practice and last chance qualifier. Gale is one of the hometown heroes at Five Flags, as the young driver won the third round of the Blizzard Series for Super Late Models. With many fans in the grandstands cheering him on, Gale is focused on success in his first Snowball start. “With this being one of my home tracks, we really wanted to try to qualify in the top 15 from the time we got here. ”We luckily didn’t have to do much to the car after hitting the wall,” said Merrell. “We had to get a lower A-arm and fix the ball joint and some other things like the sway bar, but it wasn’t too bad. We were right back on the track after that and I think everything’s squared away now and we can be good today. Despite not making it into the Derby on time, Merrell was optimistic for his chances to make it in through the last chance race based on his improvement from practice to qualifying on Friday. “We were pretty happy with the qualifying run even though we didn’t make the field,” said Merrell. “We picked up over a half second in qualifying from practice yesterday so that was a big confidence booster for us. I think we can get into the top five in that last chance race and make it into the race. Unfortunately, he didn’t make the show through the last chance race and was one of several drivers going home. The biggest event in Saturday’s practice session came early in the session when David Rogers was sent spinning into the turn three wall after trying to avoid the car of Snowflake 100 competitor Brandon Sager. Sager was traveling down the backstretch at a slow pace after just leaving pit road. With Rogers at full speed down the backstretch, Sager merged into the groove just at the time as Rogers was racing in it. The cars made contact and both sustained heavy damage, leaving both drivers dejected. Sager’s machine also sustained heavy damage in the incident, but the youngster took the blame for himself. Despite his crew’s best efforts to repair the car, Sager’s machine was not able to make it into the Snowflake 100 race, falling just a few positions short of transferring into the main event. He won the pole for the Bomber feature on Snowball Thursday and went on to win the feature. 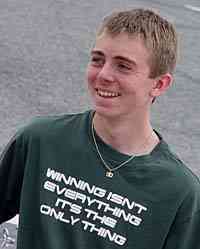 Then his brother won the pole for the Snowball Derby on Friday. 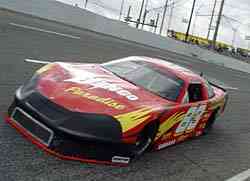 So it was up to Stevie Mercer to keep the trend going and win the pole position for the Snowflake 100. 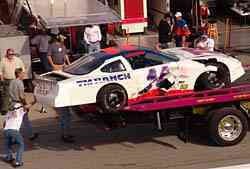 David Rogers car was wrecked in practice on Saturday afternoon. Rogers’ damage kept him from getting back on the track on Saturday. The team spent the entire afternoon and night working on it to get it back together in time for Sunday’s 300 lap Derby feature. “Maybe we can even make it three poles for the weekend for the family,” said Mercer. Although he fell short of the pole, his 23rd place qualifying run put him safely in the Snowflake. In just his third Late Model race of his career filled with much success in street stock divisions, Mercer is still adapting to the art of driving a Late Model in the biggest race of his young career in the division. “I’m getting pretty comfortable in the car,” said Mercer. “I’m not used to cars like this, that’s for sure. Going into the corners in the Bomber car, if it breaks loose I can expect it to come back to me. The steering is just so much quicker in these cars, they’re a whole different animal. We practiced good yesterday and I think we can probably get a good qualifying run, maybe even a top 10. Mercer wound up finishing 20th in the Snowflake. Eddie Mercer talks with his brother Stevie on Saturday. Now if you were paying attention in English class, a comma is a form of punctuation used to slow a reader down to add emphasis to a phrase. A comma is not a state of health, that’s a coma. If only Bubba Pollard’s crew had gone to class that day. When pointed out that what his bumper actually says, Pollard backed away and pinned the blame for the error on his crew. NO PRACTICE FOR EDDIE MERCER?? Snowball Derby polesitter Eddie Mercer’s #72 was noticeably missing form the practice sheets on Saturday for most of the session. Mercer waited until the last few laps of practice to get on the track to dial his car in for Sunday’s 300 lap Derby. Snowball Derby and Snowflake Late Models were on the track for the first 2 ½ hours of practice on Saturday before Derby cars were allowed to practice by themselves on the track for an hour. Mercer hung around the pit area until the last few minutes of practice before putting laps on his machine. After Snowflake qualifying, Keeton Hanks had the biggest smile of all the Late Model drivers in the pit area. In his first ever Snowball Derby 100 lap race attempt, Hanks set the fastest time, but was nearly immediately disqualified from his pole winning run in post-qualifying technical inspection. Hanks went from being excited to bummed in the matter of one sentence from head technical inspector Ricky Brooks. Brooks told the Hanks team to either make their ignition box work in accordance with the rules or not be able to race. As Hanks choked back his emotions, he had to go back to the drawing board. Keeton Hanks' shirt said it all on Saturday. Hanks’s team managed to make their ignition box fit Brooks’s guidelines and were allowed to enter the last chance Snowflake qualifying event. Hanks transferred into the feature, but again was disqualified for too much left side weight in post-race tech. If you were to see Jesse Smith standing next to his #81 Snowflake 100 entry, you’d probably think he’s an eager young fan waiting for a driver’s autograph. Smith, however, is well on his way to being one of the drivers whose autographs will some day be quite valuable. Standing at 5 feet tall on his tippy toes, the 16-year-old Smith turned many heads with his Spam-sponsored Pro Late Model in practice for the Snowflake. Although he had to transfer through the last chance qualifier, Smith was a wide-eyed youngster when it came to the excitement of running in his first Snowball Derby. “We were decent in practice and I think we’ll be pretty good in qualifying trim,” said Smith. “This is my first Snowball. It’s a great race, a lot of great cars, and it’s just a great experience. It’s a great race to come to and show what you’ve got and I’m really excited about it. 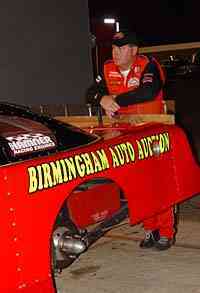 Smith raced to 15th in the ASA Late Model Series points in 2005, his first behind the wheel of a high-powered 2-barrel Late Model. A strong rookie season this season has Smith excited for the future. Many people may not have ever heard of Allen E. Brown, but if you have you know how much of an expert he is on race tracks across the world. Brown is the man behind the popular "National Speedway Directory" which lists every active racetrack across America and abroad. He has also authored the book "America's Speedways Past and Present" which goes deeper than the directory including many facilities that no longer exist. Jesse Smith gets interviewed by Speed51.com's Matt Kentfield. 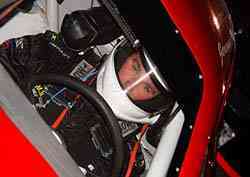 Brown made his return to the Snowball Derby and Five Flags Speedway. He was quick to point out that although the Speedway may have changed a lot over the years, the signifigance of the Derby has not..
Allen E. Brown seels his books at Five Flags Speedway. race last year. You have generations of racers running this event. It's hard to describe it to anybody how big this show is.